AbbVie retains top ranking in Great Place to Work in Norway report, having been named one of the greatest places to work in Norway for the tenth consecutive year, ranking particularly well in the medium-sized business category over the past five years. Further, AbbVie ranked first in 2014, 2017 and 2018 and took second place in 2015 and 2016. “More than just a job means being committed, enthusiastic and passionate about everything we do. Thus, we are determined to constantly develop our employees. We want the company to be a great place to work, and additionally, we strive for it to be a place for continuous development, both professionally and personally,” says Lena Nymo Helli, General Manager for AbbVie Norway. AbbVie is a global biopharmaceutical company that, through research and development, is working to treat some of the world’s most complex and serious illnesses by creating innovative and advanced pharmaceuticals. Through highly competent and educated employees and with emphasis on innovation, the company’s goal is to develop improved treatments for patients with serious illnesses within four main areas: immunology, oncology, virology and neuroscience. 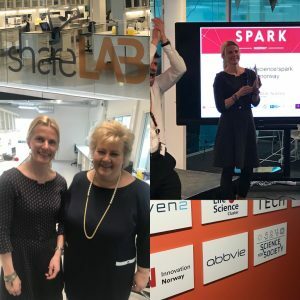 ShareLab — Oslo’s new biotech incubator — is a Launchpad for entrepreneurs and start-ups developing new life science and biotechnology products and services. Opened by Prime Minister Erna Solberg in March, ShareLab is a membership community providing a complete range of biotech innovation services. This includes access to a fully equipped and managed lab, with workbenches and special functions rooms, shared office space, as well as social areas. Professional staff manage the laboratory so that the members can concentrate on their R&D. AbbVie is a proud partner of the initiative, which is open for all companies and researchers working within biotech and life sciences seeking lab facilities and a stimulating environment.